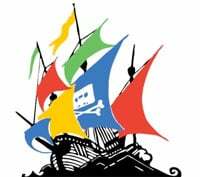 Google and Bing are not required to automatically filter "torrent" related searches to prevent piracy, the High Court of Paris has decided. The filter, requested by the local music industry group SNEP, would be too broad, ineffective, and target legitimate content as well. For years, entertainment industry groups have been demanding that search engines do something about “pirate sites” showing up in their search results. In France, this prompted music industry group SNEP to take the matter to court. Representing three local artists, they demanded automated search engine filters from both Google and Microsoft. Before the High Court of Paris the music group argued that, when paired with the artist names, “torrent” related searches predominantly link to pirated content. To counter this, they demanded a filter that would block results for these searches for the keyword “torrent,” as well as websites that include the same word in their domain name. SNEP based its request on Article L336-2 of France’s intellectual property code, which states that “all appropriate measures” are permitted to prevent copyright infringement. The same article has been used before to force Google and Bing to make various other pirate sites disappear. However, in the present cases the High Court of Paris decided against the music industry group, Nextinpact reports. In their defense Microsoft had warned that the broad filtering system requested by the music group would be imprecise, disproportionate and inefficient, something the court agreed with. While French law permits far-reaching anti-piracy measures, it also states that it’s necessary to preserve the rights of individual Internet users, such as freedom of expression and communication. An overbroad filtering scheme would go against this principle. 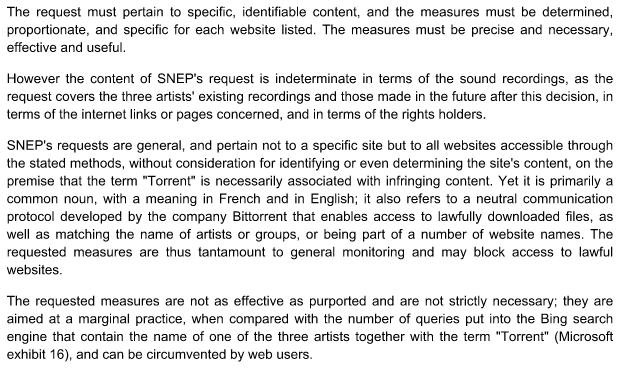 “SNEP’s requests are general, and pertain not to a specific site but to all websites accessible through the stated methods, without consideration for identifying or even determining the site’s content, on the premise that the term ‘Torrent’ is necessarily associated with infringing content,” the Court writes in its order. More specifically, the court notes that the word “torrent” has many legitimate uses, as does the BitTorrent protocol, which is a neutral communication technology. This means that blocking everything “torrent” related is likely to censor legal content as well. “Yet [torrent] is primarily a common noun, with a meaning in French and in English; it also refers to a neutral communication protocol developed by the company Bittorrent that enables access to lawfully downloaded files. “The requested measures are thus tantamount to general monitoring and may block access to lawful websites,” the High Court order adds. The case against Google, which was similar in nature, also ended in favor of the search engine. The High Court dismissed this case on the grounds that it would only protect the interests of three artists, Kendji Girac, Shy’m and Christophe Willem. For Article L336-2 to be invoked, the preventive anti-piracy measures have to protect a wider range of artists and rightsholders. This means that both “torrent” filtering requests have not been rejected. Instead, the music group has been ordered to pay Microsoft and Bing 10,000 to cover legal fees and costs. Interestingly, French media highlights that TorrentFreak would have been automatically censored if Google and Microsoft would have lost their case. After all, our URL includes the word torrent. This means that a mere mention of the artists’ names would have been enough to make an article disappear from the search results.